Holamayan is a monastery and sacred temple of Azura, located on an isolated island off the eastern coast of Vvardenfell. It lies along Azura's Coast, south of Sadrith Mora and east of Mount Assarnibibi. The monastery has been a pilgrimage site for thousands of years, with ferries coming from as far away as Ebonheart. Secretly, Holamayan became the home of the Dissident Priests, who disputed the doctrines of the Tribunal Temple. Thus, the monastery became a repository for the Apographa, the hidden writings the Temple had suppressed. The monastery itself is built underneath the surface of the island, with its entrance hidden by hills and brush. It is further protected by a magical stone hood that raises only during the times of Azura, dawn and dusk. Within, the monks pay homage to Azura and the saints of the Dunmer (not including the Tribunal). In the First Era, Nerevar undertook a pilgrimage to this temple of Azura to speak with her. She confirmed that the Dwemer had devious plans which had to be stopped at all costs, leading to the beginning of the War of the First Council. The Nerevarine came to the island in 3E 427 seeking guidance from the monks on the Lost Prophecies of the Ashlanders. Following the defeat of Dagoth Ur and the vindication of the Ashlander prophecies, the monastery made plans to rededicate itself to the study of prophecy. 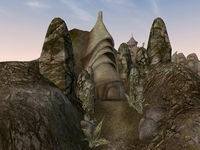 Upon the completion of the main quest of Morrowind, Mehra Milo hints that the monastery might find a new purpose in pursuing the study of dreams, as they were the gates to prophecy. This page was last modified on 5 March 2019, at 08:32.